A time of 55:13 and almost 10 minutes slower than my PB. At about Christmas I had gone for a 12K run and was finally back running good distances after having been recovering from ITBS after Ironman Oz. I was walking around at home when I slipped and kicked the door frame which I think fractured a toe. That kept me from running for two full months. I’d like to think that that is the reason why I was so slow at this race. I’ve really got a long way to go to get my fitness back. If you have to walk after 100m of a 10K then you should really be training more. With participation increasing in Singapore, more races should try to enforce starting corals. My pace in the Singapore Biathlon for the 10K run (after a 1.5K swim) was pretty much the same as today, that shows either how slow I am now or how little effort I put into the swim. Running races are so much more convenient than triathlons – You just show up with your shoes and run. No bike, no prep-work, no waves, no waiting around. Afterwards we still had time to join the family for breakfast. 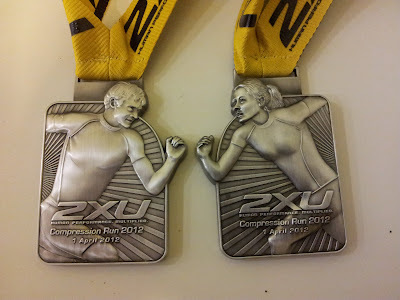 This entry was posted in race, running and tagged 2xu compressoin run 2012, race, running, singapore. Bookmark the permalink.